Internal links are hyperlinks that point to a target destination on the same domain – basically, links that direct visitors from one page to another on the same website. For best search engine ranking, internal links should always use descriptive anchor text (the text that describes the link) that is rich with keywords. Internal links serve as navigational tools within a website, allowing visitors to easily visit related content. 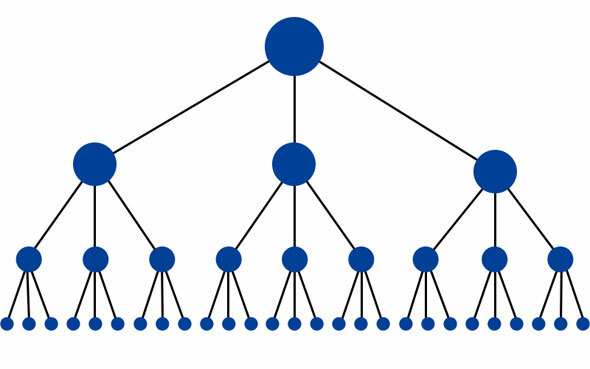 Internal links may also help define information hierarchy, and they spread “link juice,” or link rank importance, around a website. Search engines use “spiders” to explore the web; these programs crawl websites like spiders, following each link like a thread on a spider web. It is therefore important for websites to provide ample internal links, so that search engine spiders can easily discover every page on the site. The image above shows Google’s spider at Website A. Internal Pages B and E are well linked, but Pages D and C are hidden from the spider’s view. No matter how well they’re optimized or marketed, pages D and C will not be recognized or indexed by Google. This is bad SEO practice. The above pyramid is also good SEO practice because it has the fewest links, or connections, between the homepage and child pages. Having minimal links allows a website’s “link juice,” or page importance as ranked by the search engines, to trickle down from the homepage to its child pages. The more convoluted the structure, the more diluted the link juice. Search engines understand this link format, and will follow the link to index the referenced page. Search engines will also use the hyperlink to calculate other variables, such as mozRank.